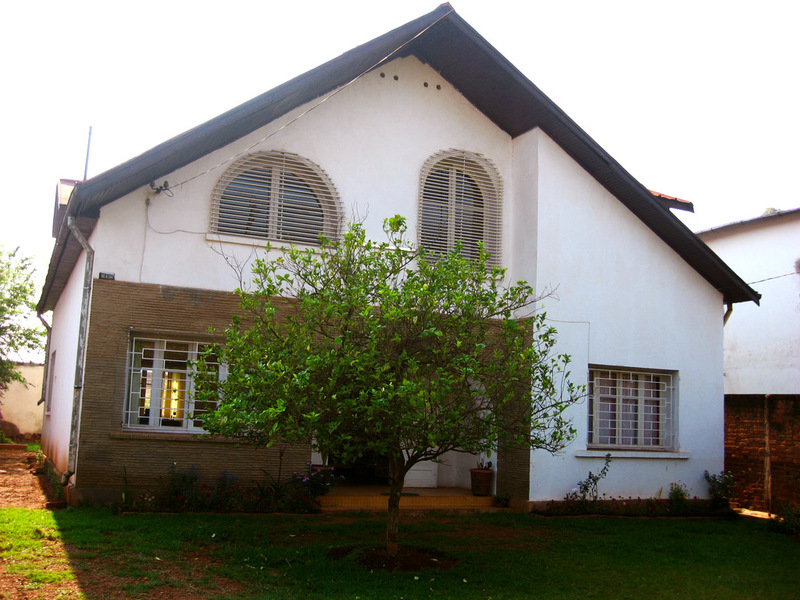 In a large, 4-bedroom house, a small family lives. Each bedroom has a well-constructed bed-frame, a soft mattress, a nightstand, and large wardrobes and dressers. They have a nice large garden full of flowering plants and trees, even a gazebo to relax outside in during the sunniest hours of the day. They have a large living room full of comfortable sofas and chairs and beautiful paintings and photographs covering the walls. An entertainment center with a nice big new TV and a great sound system isn’t unexpected. Their large dining room has a large, well-built table and nice big glass windows to look out into their beautiful garden. Their kitchen has a large stove and oven, a new refrigerator and microwave, and expensive cookware and well-decorated tableware. They have numerous electrical appliances for all sorts of minor food preparation tasks, many that aren’t used more than a few times a year. Their bathrooms have hot-water heaters, showers, and flush toilets. This family has a large new 4-wheel drive vehicle parked in their driveway or garage, which they use for distances both long and short. They buy almost all of their food and basic items at the only grocery store in town. They eat out several times a week at the best restaurants their area has to offer. They know, and have visited often, all the local attractions and entertainment. Most of their friends are other Americans or Europeans. Their children attend the nicest private schools their country has to offer, or they attend even nicer boarding schools abroad. The adults’ job-related work takes about 20-30 hours a week. But they have three or four employees, whose sole income is their work for this family, at their home. Their workers maintain their garden, clean their house and wash their clothes, watch their kids, guard their house during the day and the night, maybe even drive them in their car everywhere that they want to go. Until I mentioned the kids’ private schools and the family’s domestic workers, you may have been thinking this sounds like a very average American/Western lifestyle. And I would agree with you, it basically is. But this isn’t in America; this is here in Madagascar, or really even in most developing third-world countries. This is the fairly typical lifestyle of both former colonists and even most Western missionaries. Of course it doesn’t apply to all missionaries or former colonists, but it does apply more or less to almost all. This is simply the standard privilege that our country of origin usually brings. And it’s the lifestyle that’s always expected of us – whether we’re missionaries or former colonists – by the average person who was born and raised here. Why should the local people expect anything different from people like us? But let’s contrast that with the family’s workers themselves. 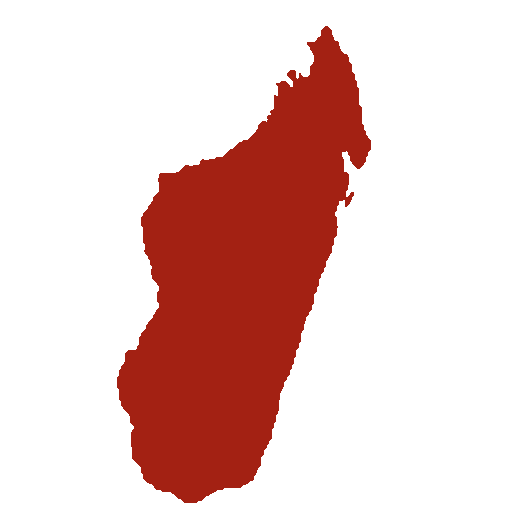 They represent about 95% of Madagascar’s population, and even within that group they’re among the more affluent members. When their shift ends, whether in the evening after a full day’s work, or early in the morning after a full night guarding alertly, they get their bicycles or they put on their shoes and they start walking or riding the 5-6 miles to their home outside of town. The road is rough and hilly, full of potholes and mud puddles, well-worn by bicycle tires, shoes, and bare feet. The landscape just a few miles outside of our town. The same sort of villages and houses where many of the town’s domestic workers return home day after day. They arrive at their home, a one or two-room hut, made from home-made bricks or packed clay, with a roof of either tin or thatched grass. This place is called “home” to a family of eight. There’s no electricity available and water is brought by the bucketful from a well that’s often another mile away from the home. They grow their own food, or to supplement what they grow, they buy small quantities of fresh food from vendors on the side of the road or in the sprawling market in the middle of town. There, it makes a big difference to bargain on the price of things like potatoes, from 25 cents for 2 pounds down to 20 cents for 2 pounds, if their haggling skills are sufficient. Their evening’s dinner of rice and leaves, with maybe a few pieces of pork fat, is cooked on a charcoal stove on the ground outside the house. People gather to squat around the cook-stove for the evening’s entertainment: a lively discussion of the day’s events and local gossip. Maybe someone even has an old beaten-up battery-powered radio that they use to listen to local music and news. They heat water over their charcoal fire, put it in a bucket, and bathe by cupping it over their heads. They go to bed not more than an hour or two after dark, the whole family sleeping together on a thatched mat on the floor. Or, if made “wealthy” by their employment, they sleep on a worn-out piece of foam, also on the floor. They wake up early, a little before the sun rises, to begin tending their rice-fields, washing their clothes, and starting the long trek back to town to work in the home of their missionary or former colonist employer. But these people, as I mentioned, are actually among the best-off representatives of their group of average Malagasy people. 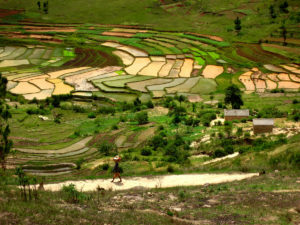 They’re nowhere near the extreme end of “poor” Malagasy people, but rather on the wealthy end of “average”. The fact that they have any job at all, but especially one with regular work and pay, sets them far apart as some of the “lucky few”. And, as is often the case when working for missionaries, they’re likely paid quite above average. And that above average pay allows them the luxury of saving to buy a bicycle, to make that long journey to and from their work and home every day. Or to buy a foam mattress for the floor. Or to have a few changes of clothes each, purchased from the used leftovers of Europe and the US. Or to eat a portion of meat a few times a week. Or to take the crowded public “taxi be” system for transport in town during the heaviest downpours of the rainy season. That’s what their well above average pay affords them. The contrast between the two families is, of course, obvious. But accurate. There are few examples of people in-between these two. And that’s the one thing that has troubled Lora and me most during our first couple of months here in Madagascar: we were, in many ways, stuck in the middle of these two lifestyles. To be perfectly honest with you, we were still much more towards the wealthy former colonist/missionary side of things, especially in our housing situation. 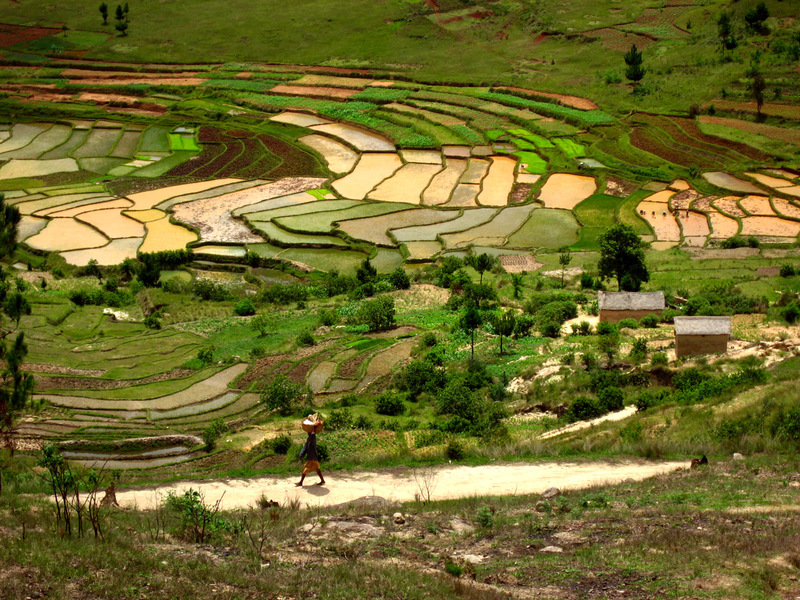 But in our lifestyle we were trying something different, something more common to an average Malagasy person. But it didn’t work well, didn’t work much at all. We were stuck in the middle, and it just confused and frustrated both groups of people. And frustrated us as well. 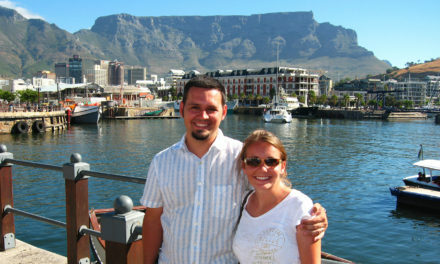 The thing is, many missionaries these days don’t directly choose to live the wealthy Western lifestyle that I described. It’s simply expected of them and they fall in line. And to live in and transition to a new country requires a lot of help from many people, people who don’t expect you to live anything other than the typical missionary / former colonist lifestyle. So, they find and prepare all the details you need to live that lifestyle and they hand it to you, like on a silver platter. Many missions organizations don’t offer a choice in that regard, and don’t even allow choices. Besides, what they offer is recognizable, it’s comfortable, it’s completely non-frightening, and it’s what everyone expects. It’s nothing like the alternative, the one I just described. It’s easy to fall in line with people’s expectations, especially if you or your organization has the wealth to support it. And with that lifestyle, you don’t even have to come into contact much with the alternative one, the one that’s common to most of the people in the country. You don’t have to see it often, you don’t have to think about it, and you certainly don’t have to choose it. Sometimes with some of those organizations, you don’t even have to learn the local language. 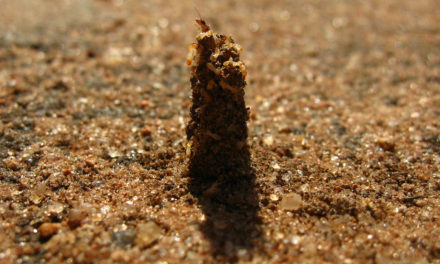 A small (but often failing) effort might be sufficient, or even none at all. And then another worker, a translator, is hired to follow you throughout your work. Our first house in Antsirabe – very fitting of the typical missionary / former colonist lifestyle, and a stark contrast from the average Malagasy person. Our organization, as well as our budget, is set up a bit differently: we make all of those choices for ourselves. 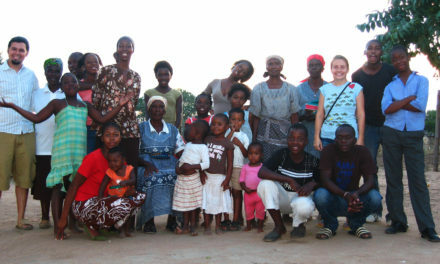 Before arriving to Madagascar, we enlisted the help of our language teacher, and all available options that she found for us were essentially for the standard missionary/former colonist lifestyle, the lifestyle she expected of us, and the lifestyle she’s seen for all of her other students. It was made more complicated by the fact that we needed a furnished place, since our time in this town is limited to the duration of our language training and it’s not feasible for us to purchase new furniture and then try to transport it to the east coast later on. We chose the only option given to us that was in town and in our budget. The family who owned the house actually gave us a big discount, saying they wanted to use their home for Christian workers. When we arrived, we found that the house was almost just like the one I described in the opening paragraph. 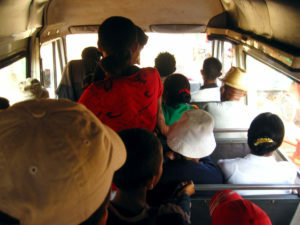 The “taxi be” public transport in most towns and cities of Madagascar. The seats are tiny and there’s always more people standing in the aisles! But also practical, cheap, and we get to meet a lot of people that way. But from there, we’ve been trying to do things differently. Thankfully, our time in the Peace Corps (where this “different” lifestyle is required) helped prepare us for it. We walk most of the places we go, and for long distances, rainy days, or with heavy bags, we ride the crowded but cheap “taxi be” public transport system. We buy most of our food (including our meat) from roadside vendors or from the market in the middle of town, bargaining for the price, just like everyone else. We eat rice and vegetables for dinner most nights. If we’re busy in town during lunchtime we eat at a “hotely gasy”, the Malagasy equivalent of a diner, on dirty benches in the open air, and surrounded by plenty of average Malagasy people. We’ve declined dozens of offers to hire permanent workers, whether for the garden, cleaning our house, security, or anything else. We haven’t yet had the chance to tour any local attractions. For all of that, instead of endearing people to us like we had hoped, it just confused them more and frustrated them often – especially those who knew where we were living. Why wouldn’t we hire workers to do all of our housework for us? Why wouldn’t we have a nice new car for ourselves? Or if not a car, why wouldn’t we pay people to pull us everywhere we wanted to go, in a pousse-pousse (rickshaw)? Why are we not automatically interested in paying a child to carry our bags around the market for us? Why don’t we know all of the other affluent white people currently in town? Why does Lora carry Matimu wrapped around her rather than in a car or stroller? At least the last question usually does carry with it excitement and appreciation from the curious observers. But when we invited average Malagasy people into our home, to spend time in friendship and conversation, they almost never stayed long or talked much. On the streets and in their homes (if they didn’t know where we lived), it was usually different. 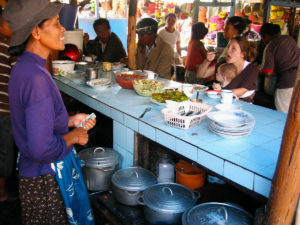 A typical “hotely gasy” in the middle of the market in town. It’s the Malagasy equivalent of a diner. 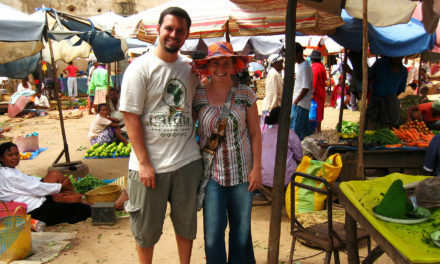 They sell good, cheap food and there are always plenty of Malagasy people around! But worse than all that, our lifestyle, in such apparent contrast with our house, even caused a problem for our landlords – a French man and his Malagasy wife. Though friendly and cordial at the beginning and magnanimously accepting our statements that we didn’t need a gardener or a security guard or houseworker or anyone else like that, they were still surprised when week after week, we hadn’t hired anyone for any of those positions. Though stating up front that they wanted their house used for Christian workers, they refused to allow our average Malagasy friends (and thus much lower class) to live with us in the house, in only one of the three empty bedrooms. Even though they were well aware that these people had been our friends for years and that they were strong Christians and had previously worked for our same missions organization and were currently in a time of need. Even though we were already paying for all of the rooms in such a large house and felt it more responsible to use the empty rooms for friends in need rather than leave them empty. Apparently after observing our lifestyle, rather than us just stating it at the beginning, they weren’t satisfied and all their initial friendliness was lost. That was probably the single toughest thing we’ve had to deal with since moving here. It weighed heavily on our hearts and minds for weeks. What had we done wrong? We struggled to make sense of everything, and to make things right. We knew a decision had to be made, but we weren’t sure which decision or even what choices we really had. Underlying all that though, there is a reason for the choices we make. There’s a model for our lives and our actions. There’s something of clarity in a complicated and contradictory world. Maybe it was no accident that all of this was happening in the time leading up to Christmas. Because in Jesus, we see something truly remarkable, truly contradictory to the ways of the world, the ways we’re used to. And in Christmas, we remember that the whole thing gets its start in an incredibly surprising way. God, the abstract Word, the Creator, the Lawmaker, the Judge, the All-Powerful, the Beginning and the End, was born as a frail little baby to an unwed mother and lay sleeping in a dirty, well-used feeding trough in a grimy barn full of work animals in the small, mostly unrenowned, town of Bethlehem, in one of the furthest outpost territories of the Roman empire. The One of most importance and distance, of all glory and power, came near to all of us, as one of incredibly humble and lowly, even somewhat despised, origin and identification, nearly as a nobody. And then he lived among us. In Christmas we celebrate Jesus’s coming, and then not too many months later we celebrate his most wondrous work, of dying and being resurrected, that we might all also do both in him. But in the months between (or the whole rest of the year, for that matter), we tend to forget that he “lived among us” (John 1:14) and what that means. Much to everyone’s surprise, and to most people’s frustration, Jesus “lived among us” in pretty much the same manner he was born among us. He grew up as a poor carpenter boy and surely plied the trade with his father. He didn’t come as we’d expect God would, as the glorious and all-powerful conquering King that he is, but instead he came as the humble servant. He gave up all that he had and was owed to live among us, as one of us. He didn’t even consider his status as God as something to take advantage of and use for his own good. (Philippians 2:6) He was rarely recognized at all until his last few years of life, and there at the end he was recognized much more with disgust and disdain than with adoration. The question on everyone’s mind was: “Why would God do what this Jesus is doing?” At the time, no one really had an answer. But he did it all the same. Jesus came to live among us, and to live as us, that in return, when his work was finished, we could live with and in him. That’s what it means to be a “Christian” – to be “like Christ.” When people talk about the “Good News”, they usually talk about a few historical events, mostly Jesus’s death and resurrection. And that is, really, good news. But equally important, no less, is the fact that Jesus lived with us and as us. He gave us, right where we are, hope for new life. He is new life! When people talk about “living the Gospel” (the Good News), they’re usually talking about a set of moral standards, or even just the Ten Commandments. And that is certainly part of the way we must live. But I think “living the Gospel” also means living the sort of life of Jesus. The “Word became flesh”. We can’t just speak about the God who was willing to live life with us, in all its uncomfortableness and inconsistencies and times of pain and suffering, and then just try to live high moral lives ourselves. But we should also live life with the people we’re speaking to, no matter how uncomfortable and painful and confusing it can sometimes be. When, in history, the “Word became flesh”, he wasn’t the God who stopped by our little grimy corner of the world on a Sunday morning to tell us how we ought to live or who we owe allegiance to. He didn’t build a palace full of the best modern luxuries right in the middle of our own squalor. He didn’t use some foreign technology and a fancy presentation to outline the proper method of thought. He actually became flesh, and lived among us, and with respect to everything but our sin and our shortcomings, as us. If we say we want to practice what we preach, if we want the “Word” that we’re sharing to truly become flesh, then we need to live the same way. How can someone recognize the truth of the Good News we’re sharing, that God came to be with us, if they don’t see it in our lives, if we’re not willing to be “with” them ourselves? This truth is something that constantly challenges Lora and me in the work that we do. As we weren’t born Malagasy, nor do we look Malagasy, we can never be fully “in the flesh” the way that Jesus was for us. Maintaining relationships with people of all different countries and statuses also makes it difficult to just be one thing or another. But as these are the people that God has sent us to, we have to try hard to live the sort of life that Jesus lived when he was sent to us. That recognition affects all of our decisions here and weighs heavily on our hearts and minds. Last week, we decided to move from that obstinately large and distracting house into a small apartment, less than ¼ the size of the house we were in before. I can’t say it perfectly suits our needs and our ideals, but it’s a lot closer than we were and it’s the best we could find for the time being. A lot more average Malagasy people live nearby and engage in conversation with us regularly, our living room/dining room isn’t frighteningly large, and people don’t seem nearly as surprised to see us walking down the road when we leave the gate. To live “with” the Malagasy people, the way that Jesus lived with us, is something that we’ll always be striving to do better. And as we learn the language better, learn the culture more, and have more experience here in general, we’ll get better at it and have more opportunities to do it. Then, the “Word” that we’re sharing can be not only an abstract concept, but something in the flesh, something recognizable, something surprising and wonderful. The same way that Jesus lived with and as us right where we were, that we might in turn live with and as him, we also want to live the same lifestyle among the Malagasy people, that they can then truly see and find new life in Jesus, right where they are. Now that Christmas is passed, and with it the standard bit of time for remembering Jesus’s birth, I want to encourage you to not forget his life: that God, Jesus, lived with us, and that he still lives with us. And please remember the way he lives, among us and as us, rejecting his glory and power and living instead in humility. You should do the same! When you have some opportunity to be with those in need, even if it means giving up some comfort, forsaking some status or prestige, letting go of something you feel like you’ve earned or are owed, then do it! That, more than just moral rules, is what it means to practice what we preach. To be with and as those in need, and through that to fulfill their needs – what an amazing and incredible story! Let’s live it! A standard “épicerie” on the side of the road in Antsirabe. 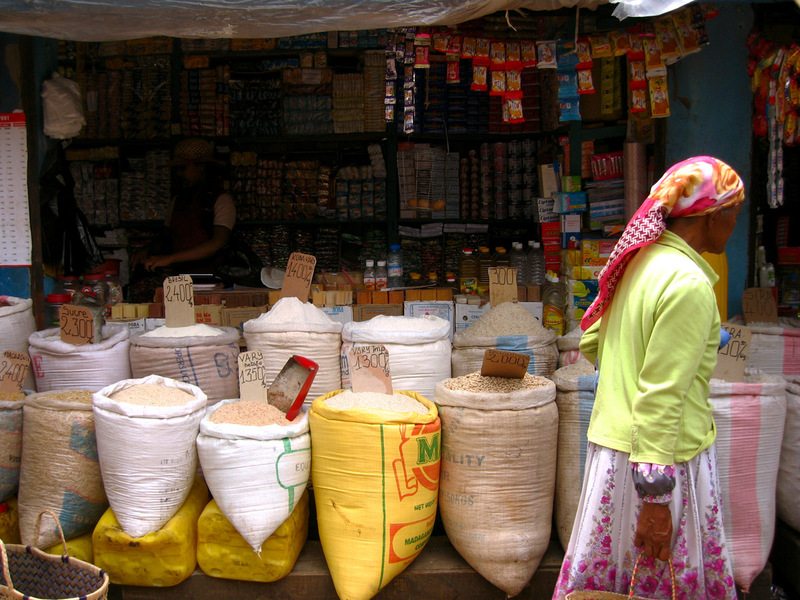 Here you can buy any quantity of several types of rice, flour, sugar, and an assortment of manufactured goods.